Kimbra Hickey, barely known but known, as the hand model for the Twilight Cover! Rob's ADORABLE Westie, Patty. Cute as heck, and still in London as Rob misses her all the way back in L.A. When Meyer began writing Twilight, she didn't yet have names for Edward and Bella so she called them 'he and she'. Later she gave Edward his name, and named Bella Isabella, the name she'd been saving for the daughter she'd wanted but never showed. Thousands of fans outraged by the casting of Rob Pattinson in Twilight demanded that he be sacked and replaced by Tom Welling from 'Smallville'. 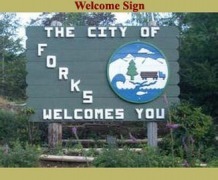 More than 100 Twi fans travel to the real town of Forks, Washington. There, a small restaurant named Sully's Drive-in even offers a Bella-Burger with a set of plastic vampire teeth on the side! At the beginning of writing her debut novel, Twilight, Meyer was calling it 'Forks'. To view some of the original covers to it and other of the Twilight saga's original covers, go to www.stepheniemeyer.com and click on 'Other Projects' then click on 'Craptastic Covers'. 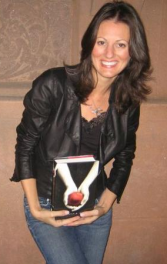 Stephenie Meyer can be found next to a laptop ordering a vegitarian sandwich at the restaurant in the beginning of the scene where Bella is being asked if she likes any of the boys in town. Katie Powers, Kristen's stunt double supposedly also plays a waitress at the diner. During rehearsal of the big kissing scene of Edward and Bella, Rob got a little enthusiastic and fell of the bed. -We don't think Kristen's boyfriend Michael Angarano will like that one bit. I wonder about if he worries about the fact Breaking Dawn might become a movie. Kellan Lutz, who plays Emmett Cullen, the large, buff, bulky brother of Edward Cullen intended to grow out his originally curly hair for the part of Emmett but his previous role in "General Kill" required a buzz cut and his hair didn't grow back fast enough for the filming of Twilight. Kristen Stewart starred in "Speak" a 2004 film also casting her current boyfriend, Michael Angarano. The New Moon movie is aiming for November 20th, 2009 as its release date and will start shooting in Vancouver, Canada March 23rd. Taylor Lautner had to wear a wig for his role as Jacob Black. The Twilight from Edward's perspective, Midnight Sun (Code named Dark High Noon or DNH) was supposed to be released spring of 2009 but a mysterious leak (which Stephenie claims to know who was behind the deed) hurt Stephenie and forced her (emotionally) to quit writing it. Rosalie was originally named "Carol" and Jasper "Ronald". The JoBros wanna be on the "New Moon" soundtrack and are 'supposedly' Twi-fans who were invited to the Twilight premiere, but couldn't make it. A lot of people have been saying things to that like, "HELL NO!" and , "Please, NO JONAS BROTHERS!"..... you get the picture. All we can do now is stand back and hope director Chris Weitz makes a good choice. Annalynne McCord, who may possibly be cast as Heidi in 'New Moon' was going to play Rosalie for 'Twilight', but her schedule didn't work out. *UPDATE* Probably not; her dang schedule ruined it again.